We did have a doctor join this week but another would never hurt. 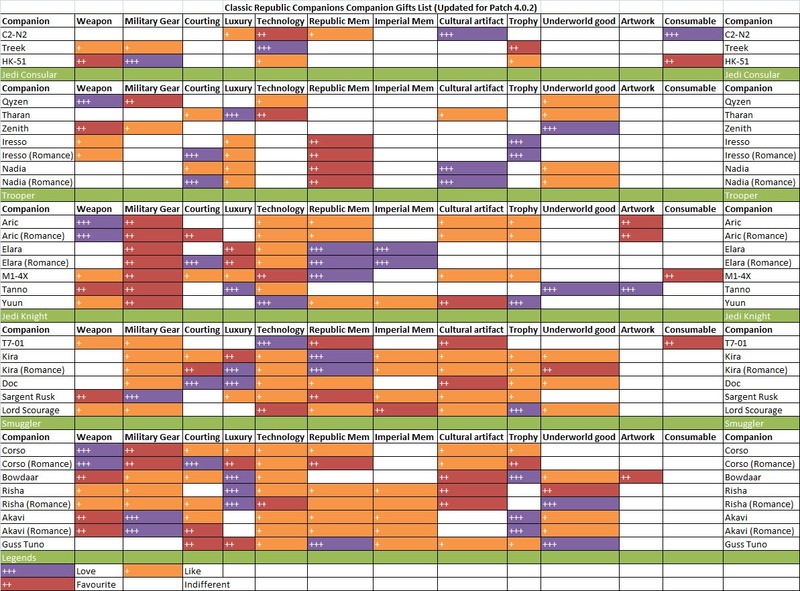 On a daily basis, we're seeing a small amount of Sith lords, untitled Sith, agents, soldiers, and a couple of Mandalorians. Smooth seas do not make a sailor. One of our officers is gearing up to formulate a non-Sith assault team as an option for our Imperials and Mandalorians. 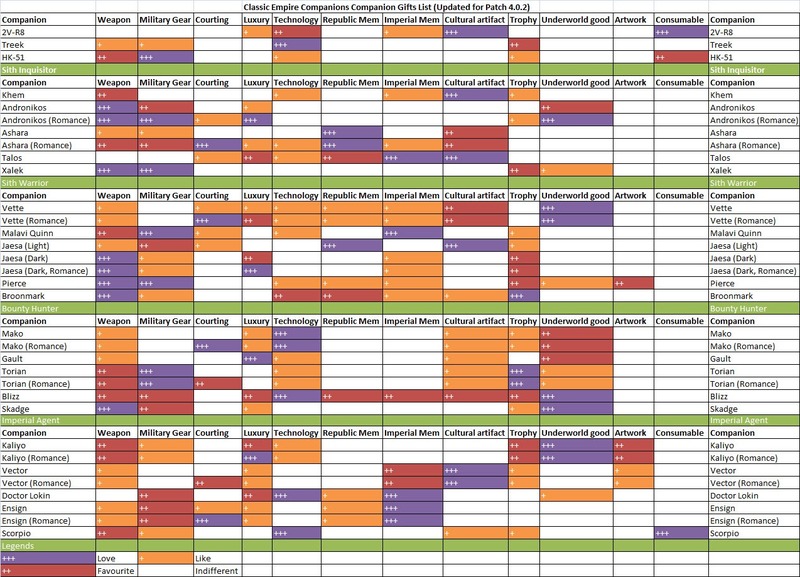 The aforementioned list is still relevant; come join our community! 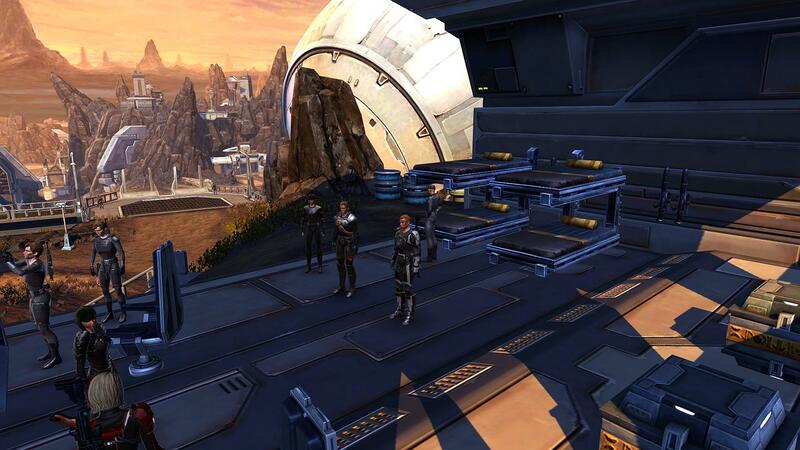 We've been using Balmorra as the OOC backdrop for our current campaign (9th overall), which is against the Republic. You might have seen us around in RP. I may be interested in joining however I'd like to discuss a little more about how my character may fit in. If we could talk that would be greatly appreciated. Certainly! I would need to know more about your character though. Feel free to PM me. Here's a rundown of our event last night that closed out our guild's Ninth Campaign, which had been more 'mil-sim' than usual for us. Thanks to all who participated! 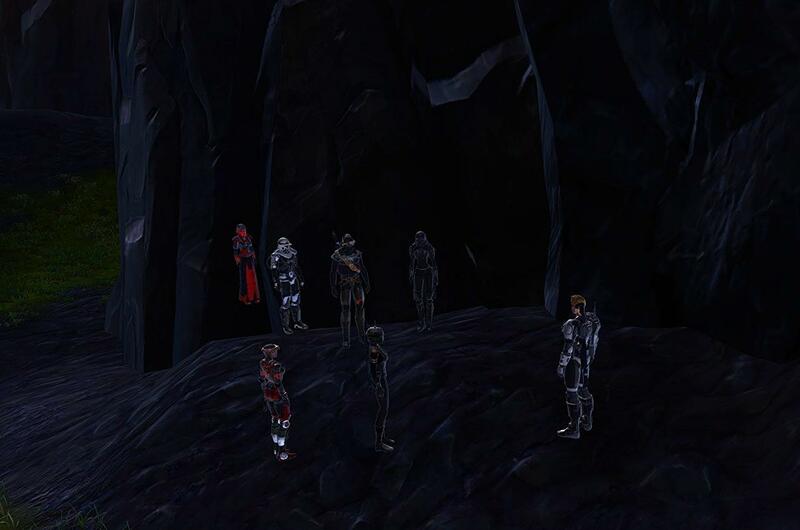 We held the entire campaign OOCly on Balmorra and saw a lot of RPers take interest. Cipher Ten (Kaydrin) discovered that a search party had gone missing when it investigated an adjacent unit, the 75th Imperial Infantry Brigade, dropping from comms. The Ninth had sent a recon squad to investigate, accompanied by Kitsura, but it had failed to report in. 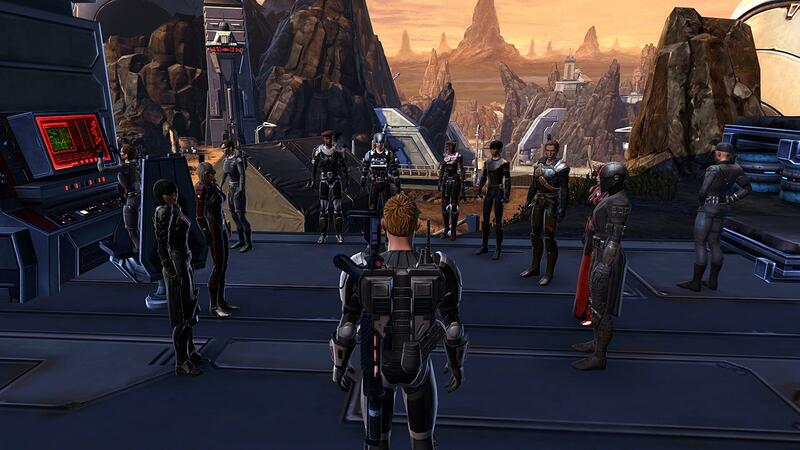 A larger, more potent rescue party was formed and sent to rescue the Imperials. The mission was a part success, with Kitsura rescued and many Jedi encountered. The rescue team avoided a potentially devastating trap but was not able to rescue the recon squad. Cipher Ten received news that a recon squad had been sent over two hours ago to investigate why the 75th Infantry Brigade, which covered the Ninth's eastern flank, had not reported in. The squad had also had Apprentice Kitsura with them. She had volunteered to go out of apparent boredom. Ten informed Cipher Eleven—the acting Watcher—and Lord Justicar Zareh Vorantis. Ten was instructed to form a rescue party. The response for able personnel was impressive, with Lord Vorantis, Archivist Skylarkke, Apprentice Takesian, Cipher Eleven (Praskoviya), Cipher Seventeen (Matikai), Fixer Seven (Khatos), Captain Kyle Merkan, and Kaydrin all going along with a second recon squad. They used two shuttles that flew low and landed on the other side of a ridge from the 75th Headquarters. The 75th was a major supply hub for the front lines, and its base was protected by an almost stupendous amount of heavy anti-air (AA) guns. Kaydrin, Praskoviya, and Takesian led the recon squad forward and found a crashed Imperial shuttle as well as signs of recent battle, with Republic bodies lying inside the base as well as smoking debris. They also found their comms jammed and returned to Zareh to report in person. All agreed it was an obvious trap. Kaydrin used the recon team to scout the entire perimeter, while Praskoviya, Takesian, and Kyle scouted two bunkers on the perimeter, each of which had two stealthed Republic scouts inside, confirming the trap. Kaydrin recommended slicing the AA guns, while Takesian spotted the source of the comms jamming—a sensor tower being reprogrammed by three Republic figures further inside the base. Khatos sensed the presence of the Force inside the base including the light side. 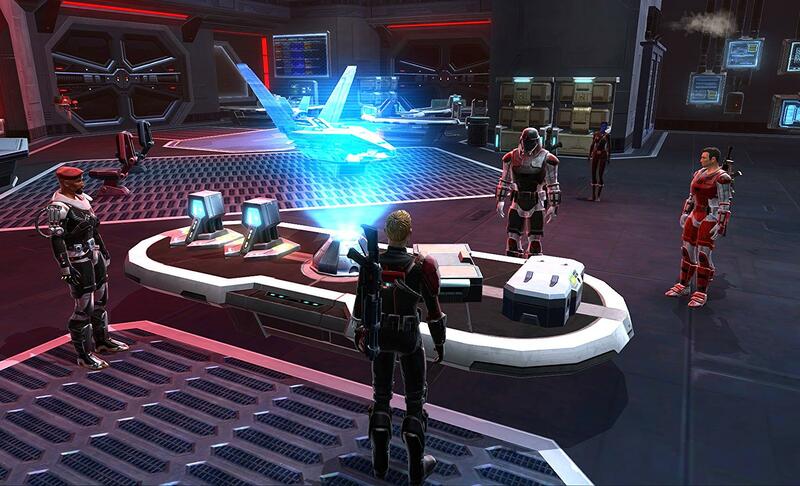 Zareh recalled everyone away from the base to plan and was also able to reach Kitsura using telepathy. Kitsura was not captured, but claimed that three Jedi had used a Force power to 'freeze' the rest of her team and took them further inside the base. She claimed there were regular soldiers as well as some in heavy armor. They and some techs went into a bunker inside the base with some equipment. She was told to remain out of sight and then later instructed to peek into the bunker to learn more. She used her Force Cloak to do so. Things escalated when Kitsura informed Zareh using telepathy that a Jedi had spotted her and was giving chase. Zareh instructed her to give up and learn what she could, and that might serve as a distraction for the rescue team. Khatos sliced both AA guns near the perimeter for the use of the rescue team. The plan was for Khatos and Kaydrin to use the AA guns on the comms jammer and then any turrets or other AA guns inside the base. The rescue team would storm the bunker where the Republic techs and Kitsura were being held. Kitsura also updated them that the Jedi were expecting reinforcements including starfighters. Kaydrin used an AA gun to destroy the sensor array while Khatos attacked turrets. Khatos then accompanied the main team in while Kaydrin watched outside along with his recon squad. The main team spotted 4 Republic soldiers and 2 Republic troopers with heavy armor and rocket launchers guarding the bunker entrance. The Imperials attacked, with Praskoviya dispatching the soldiers with a flash-bang grenade. The armored troopers proved harder to take down, with sustained fire from Kyle and Praskoviya, along with telekinetic attacks from Skylarkke, Takesian, Khatos, and Zareh doing the job. Zareh stood on point, warding the rest of the team from blaster fire. Two rockets were fired at Takesian and her, but Zareh pushed with the Force to redirect them past the team. Kitsu warned Zareh using telepathy that 3 Jedi, 2 armored troopers, and 6 soldiers were coming, and she had been taken out the other side of the bunker further into the base. Sure enough, metal boots could be heard., with both parties waiting for the other to turn the corner into an ambush in the bunker tunnels. 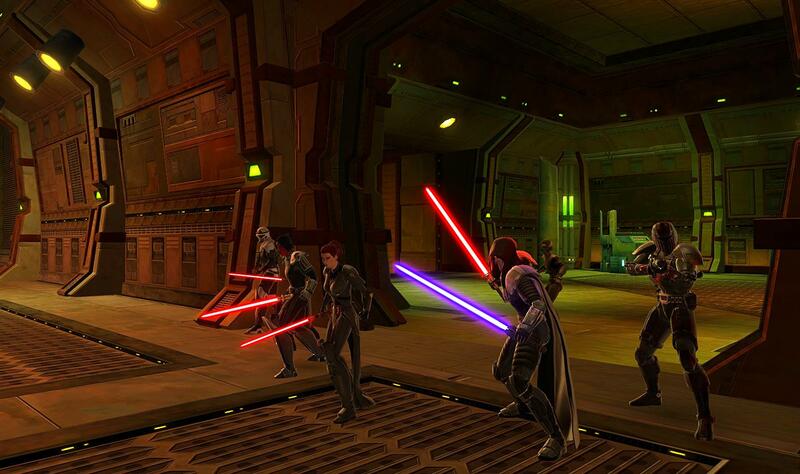 A Jedi Kel'dor instructed the group to surrender, and Zareh ridiculed the Jedi. She, Takesian, Khatos, and Kyle finally decided to use stealth to peek, spotting two Jedi with blue lightsabers, two armored troopers with rocket launchers, and six Republic soldiers. The Imperials pulled back. Kaydrin reported from outside that there were Republic starfighters hovering over the area, and added that he had made the call for Imperial air support. Zareh instructed Kitsura to escape if she could, and then the Jedi charged the tunnel. The Kel'dor led their charge, deflecting streams of blasters and Force attacks with relative ease as he engaged Zareh. 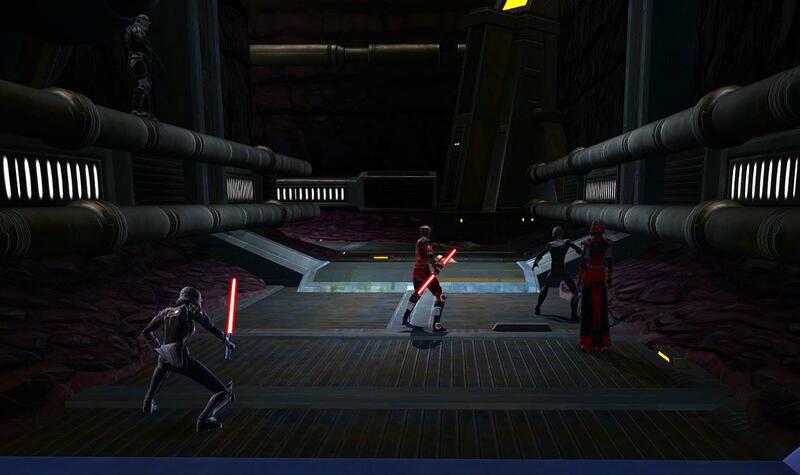 A young Mirialan male Jedi attacked Khatos, and a third Jedi emerged from the shadows to attack Takesian. Zareh, Takesian, and Khatos held their own but Zareh called for a withdraw once it was confirmed that Kitsura had escaped with a Jedi padawan chasing her. The group retreated as Zareh used the Force to rupture a giant pipe in the bunker, filling the tunnel with steam. The Kel'dor held his forces back, sensing danger outside. Sure enough, Kaydrin reported that no less than four squadrons of Imperial starfighters were clouding the skies, and that darths sure knew how to make things happen. The group quickly returned to the perimeter at a full sprint, seeing Kitsura being pursued by a twi'lek female Jedi, who turned to quickly flee behind cover when she saw the other Sith. "Leave her!" Zareh instructed, wanting them to head for the extraction point. The team returned to their two shuttles and arrived at their base. Zareh ordered Kitsura to provide a thorough report to Kaydrin and to immediately inform the War Council of the developments. Bump! After a very quiet summer (as usual), we starting to see members come back and are getting ready to launch our 10th story campaign! We've had some new lords join, which is fun. 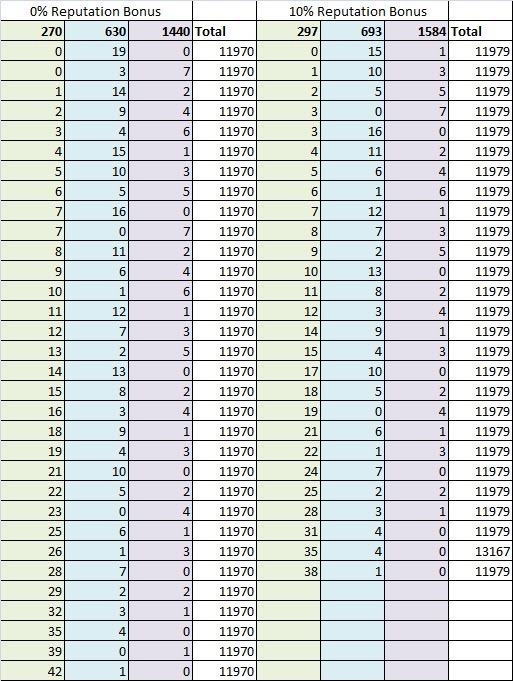 We just started our tenth major campaign story with people starting to return from the summer! The Jedi attack against me was as baffling as it was illogical. What had spurned it? Who? Once before, nine years ago, the Jedi had struck at us. It had been a surprise then, but their ire made sense. 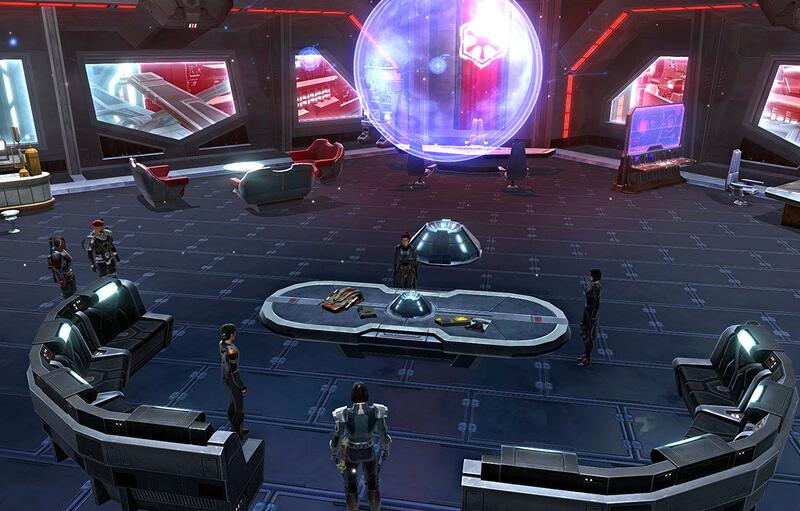 We had captured some of their top scientists in Rakata and Gree technology from Balmorra. We had slaughtered the Jedi guarding them. It had created a year-long shadow war against a Republic task force led by a Jedi Master named Balaron along with his SIS Bureau Chief ally, Ren Korvus. Both had been killed in the end, their network scattered. One year ago, an Imperial traitor who had once been a Watcher of much renown turned up leading a small Republic fleet. He had spent years with the Republic building trust and turning his innermost secrets to them. Though his Republic fleet was small, his knowledge of Imperial disposition, communications protocols, and the presence of an expansive spy network in Imperial space allowed him to inflict alarming damage. When his fleet and ours collided in a final battle, we barely survived, but we did emerge victorious, with Rallin Montevor dead. There was one common denominator between both incidents—Jedi Master Sovena. She had been Balaron's second-in-command, a seer who guided Balaron with her visions. But why now? I have learned that Sovena had been visited by an unknown Jedi master who sought my location. The timing is...curious, given that I've caused the Republic no trouble on my own, and our Ninth Fleet—after Chardaan—had disappeared from the Imperial registry and become covert once more. Lord Vanshene Ambersol had commanded the Order's combat teams before, but it had been a couple of years. Now was her opportunity once more, and she wasn't about to mess it up. After assembling a team in the Tactical Operations Center, she noted that the team was small but would be effective. Lord Zareh Vorantis and Lord Reagilus Cadael had agreed to form the front line with herself. Acolyte Khatos Sahael, Imperial Army Captain Kyle Merklan, and the former Mandalorian, Merlian. It would so, she told herself simply. The team was briefed on the mission as well as the latest information provided by their deployed ciphers. A stock Mandalorian cruiser had entered Nar Shadaa's space and used a tractor beam to capture the High Lord's phantom-class ship, a rarity in the Sith Empire. Vanshene felt compelled to note to Khatos that the ship class was more rare than Sith acolytes when he interrupted her. Oddly enough, the cruiser had been occupied by Jedi and Republic personnel but not Mandalorians. The High Lord had escaped, but the vessel was still aboard the cruiser, which had left the system for an area of nebulae called 'the Maw.' It had then been tracked to a system not far from Hutt Space called Boz Pity, which was a graveyard world for the system's former inhabitants as well as neighboring systems. The group noted this was obviously a trap. A tactical boarding had been the decided course of action, with the ciphers boarding the cruiser in advance in secret. The rest of the team boarded a Fury-class interceptor that would exit hyperspace dangerously close to the cruiser. The Resurgence fleet would be minutes away using hyperspace travel. The plan was to traverse from the hangar to the engineering deck, using out-of-the-way maintenance corridors to reach the hangar at which the phantom had last been located. After the boarding party landed in the maintenance hangar of the cruiser, which had been opened by the ciphers, Lord Taradyn Veldras and Lord Infernos (Kaius) remained with the shuttle long enough to ensure there was no attempt to cut off the boarding group's retreat before they rejoined the main party. The group encountered some common battle droids but made quick work of them. Once they entered a larger engineering area, a trap was sprung. Six battle droids fired at them from a balcony above and in front of them while four larger advanced droids with ray shields and heavy assault cannons. Vanshene, Zareh, Reagilus, and Kaius each engaged one of the advanced droids, keeping the assault cannon fire away from the rest of their group. 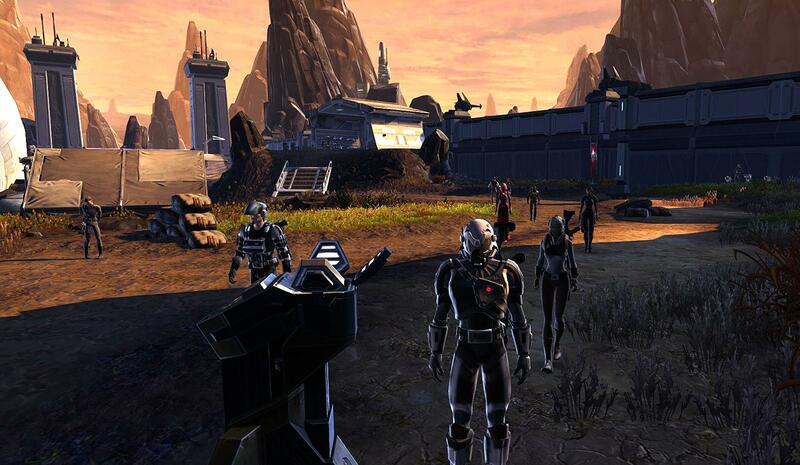 Kyle and Merlian used strafing fire and explosives to neutralize the standard battle droids, with Khatos and Taradyn using Telekinesis to destroy the remaining ones. Zareh took several blaster shots and was wounded, but they eventually defeated the powerful advanced droids. Reagilus noted with alarm that the presence of no living defenders was worrisome, and sure enough, there was a chain of explosions that was set off as they neared the target hangar. Vanshene ordered that her Fury be moved to the hangar with the phantom and for a grumbling Kyle and Merlian to quickly check for bombs and traps on the phantom before they stole it. Not long after, they departed in both vessels and entered hyperspace. The phantom was diverted to more rigorously examine it for traps and beaconing devices before it arrived at the Resurgence. The ship's nav logs and access codes had been tampered with, but this likely compromise had already been anticipated two days ago, and a warning sent to Imperial High Command. It was noted that scuttling the cruiser as a trap would have been more effective if the first explosives had gone off in their hangar. 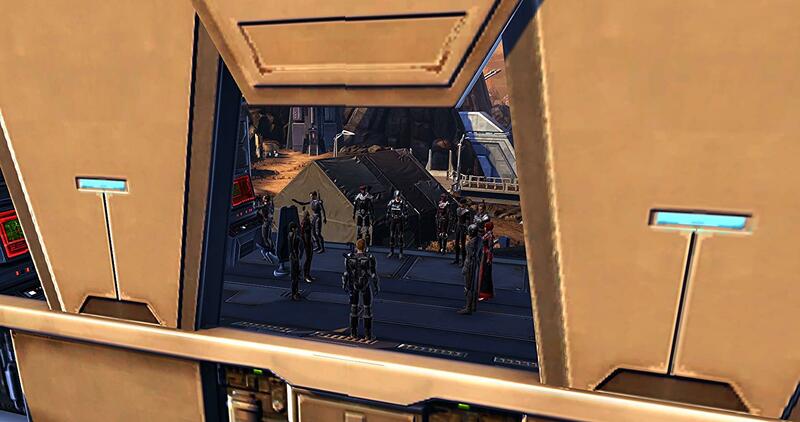 Been awhile since we've had 5 non-Sith in RP! Here we have two ciphers, a Lieutenant Commander in charge of our fleet's marine forces, and an Army Captain in charge of security at our public headquarters.